Limited Edition. Limitless Style. 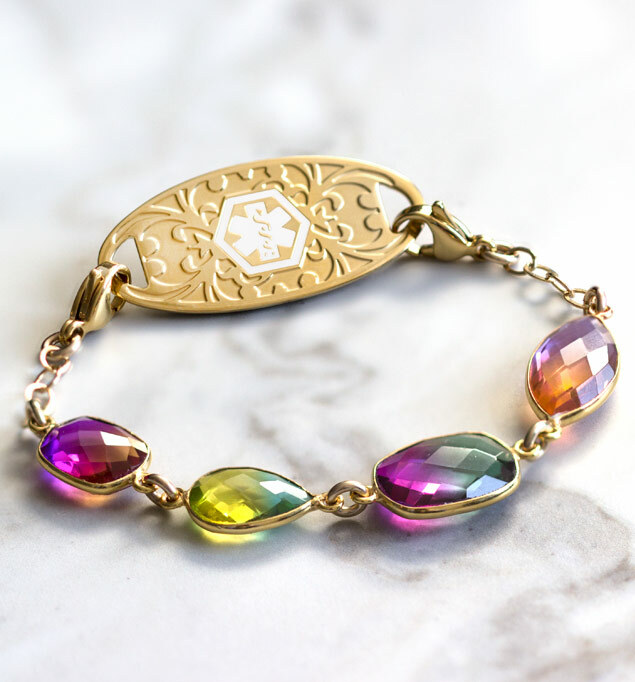 With the perfect blend of jewels and gold, the Limited Edition Bauble Bracelet is the centerpiece of the Lauren’s Hope 2019 Studio Collection. This fresh take on medical alert fashion incorporates multi-faceted, 22 karat gold bezel-set jewels in light-catching hues for a modern take on a distinctly classic style. Individually crafted by our master jewelers, Bauble is a Lauren’s Hope Exclusive Studio Collection Style featuring hand-selected gemstones, each unique yet complementary. Your Bauble Medical ID Bracelet pairs with any custom-engraved Lauren’s Hope medical ID tag, keeping what’s truly most important to you right at hand. This stylish med ID is a great choice whether you or your loved ones wear medical alert bracelets for a history of weight loss surgery, celiac disease, epilepsy, Long QT Syndrome, or any other chronic medical condition or treatment consideration. Custom engraving allows you to choose the look you want so you can stay safe in style.